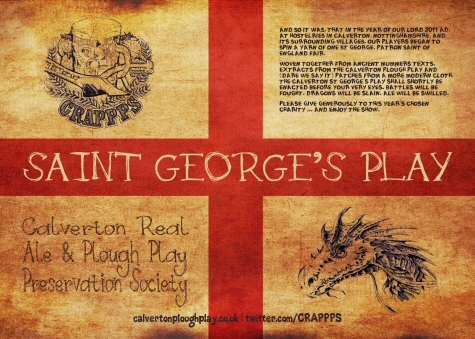 The Calverton Plough Play is performed each January in Calverton, Nottinghamshire, and its surrounding villages, by the good men and true of the Calverton Real Ale and Plough Play Preservation Society (or CRAPPPS for short). CRAPPPS has performed a Plough Play each year since 1979, raising more than £26k for Nottinghamshire NSPCC in the process. The origins of Plough Plays stretch back hundreds of years. Only a fragment remains of the original Calverton script so the version currently performed combines text from various other Nottinghamshire scripts (though mainly from the Cropwell version). April sees performances of The Calverton St George’s Play. The Calverton Plough Play is now recognised by the National Traditional Drama Research Group based at Sheffield University as a tradition in its own right. This website is fondly dedicated to all matters CRAPPPS. Thank you for stopping by. We look forward to seeing you in the ale house soon for a drop of the Doctor’s whiff whaff.